The impressive clubhouse at Solera at Anthem offers resort-style amenities and great spaces to socialize. Set in beautiful Henderson, Nevada, Solera at Anthem welcomes active adults aged 55 or better with affordable homes and resort-style amenities. This Del Webb community supports an active lifestyle, which appeals to both snowbirds and full-time residents. Solera at Anthem was built by Del Webb between 2003 and 2008. It is nestled beside Del Webb's larger Sun City Anthem community, in the foothills of the Black Mountains. Although smaller than Sun City Anthem, Solera at Anthem offers its own fabulous amenities, as well as 1,822 homes in both single-family and attached designs. Active adult homebuyers focused on low-maintenance living may prefer one of the community's attached villas. Arranged in duplex and triplex configurations, these lovely homes were built between 2006 and 2008 in two models: the 1,519 square-foot Jefferson and 1,590 square-foot Monroe. Each of these floor plans include two bedrooms, two full bathrooms, separate dens and an attached two-car garage. Those who prefer detached living can choose from available single-family designs. These homes, built between 2003 and 2008, were originally offered in five floor plans ranging in size from 1,140 to 1,771 square feet. They typically include two or three bedrooms, two full bathrooms and two-car garages. Some homes also feature a separate den. 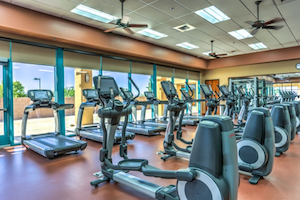 A state-of-the-art fitness center helps residents meet their fitness goals and lead a healthy lifestyle. Beyond its appealing homes, Solera at Anthem brings residents together with a variety of resort-style amenities. The community's social and recreational activities are centered around its 24,000 square-foot clubhouse. Here, residents can relax in the library, mingle in the lounge, meet with a special-interest group or attend an event in the spacious multi-purpose room. The fitness center includes cardiovascular and strength-training equipment, an aerobics and dance studio and an indoor pool. The clubhouse also features a number of hobby and game rooms. Residents can enjoy some friendly competition with a game of cards or billiards, make use of the catering kitchen, learn something new in the computer lab, or express their creativity in the arts and crafts studio. It is a great place to meet new friends or pursue a new interest through one of the community's diverse social clubs. 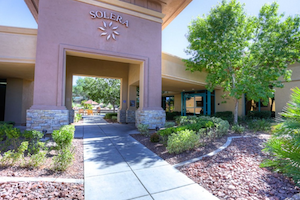 Solera at Anthem's outdoor amenities let residents enjoy the beautiful Nevada weather as well. The scenic grounds feature an outdoor patio and spa, a picnic area, four tennis courts and four bocce ball courts. Walking and biking trails also make it easy to get some fresh air while exploring the beautiful community. Active adults who choose a home in Solera at Anthem will enjoy resort-style amenities and an affordable home, as well as a prime location near world-class shopping, dining and entertainment.